Shoot'em all game with Mario characters and modern weapons. Become Hambo! A rogue pig on a lone adventure against those who have invaded his home. Use arrows, grenades, C4, Uzi's and whatever else you can find to explode, shoot and destroy the enemy before they take over. Become one with gravity in order to kill the cute but none the less deadly zombie hordes which have inhabited the same green sphere or earth floating in space as you have. Try to shoot as many balls as possible. Older balls give more points. 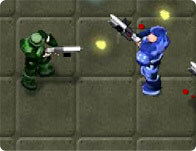 Melt metal with the flame-thrower and plasma gun, throw grenades in this sizzling, fun-packed action game. Help the cowboy bullet go through all the coins tossed up in the air, to score the maximum points and win the bet. Guide a Tankopter through obstacles and walls without crashing while shooting obstacles. Collect and use bullets wisely in this extreamley addictive strategy and skill game.